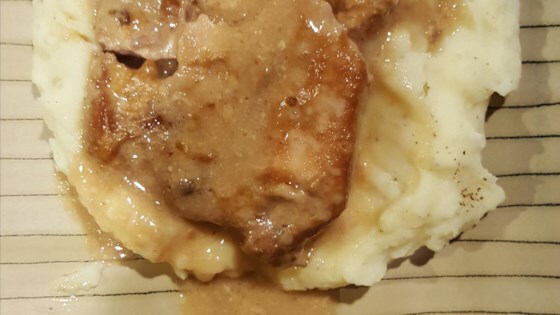 "Pork chops slow cooked in a yummy creamy sauce, served over rice." Rub brown sugar into pork chops. Place chops in shallow dish and pour soy sauce over. Cover and refrigerate. Allow to marinate for one hour. Pour the cream of mushroom soup into the crock of a slow cooker. Remove chops from the soy sauce and place on top of soup. Cover, and cook on Low until very tender, 6 to 8 hours. This came out good. If I make them again will make it just like the recipe calls for. I added mushrooms to this recipes and they really didn't go well with this flavors. Wow!! This is one meal that we all loved!!! Next time I will cut down cooking time by half. (3 hours). I used thinner chops.